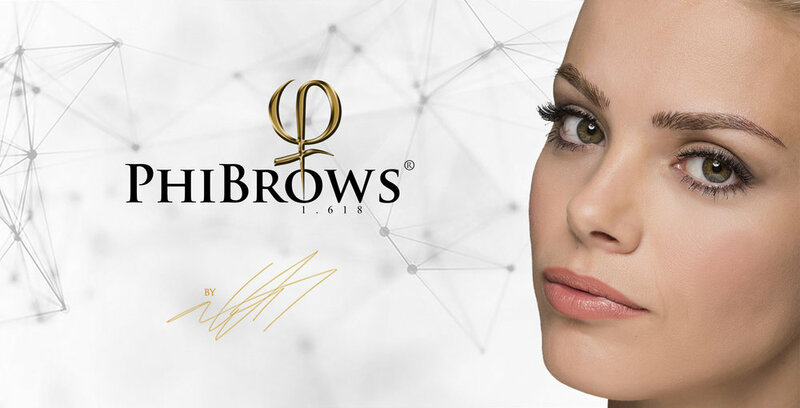 Phibrows Microblading is a manual "hand" method of semi-permanent make up for your eyebrows which creates extremely fine natural looking hair strokes. This method is ideal for anyone wanting to enhance the look of their eyebrows. The results are a natural, flawless, fuller looking brow. When a client has very few natural hairs, microblading technique is combined with shading in order to get shadows that improve the volume.The combination of both techniques is called PhiFusion. It is absolutely crucial to have a touch up done, as it is very difficult to predict how well the skin will retain the pigment. Generally Microblading lasts from 12 to 18 months, depending on skin type… normal, oily, or dry, and age… young or mature. Microblading is not permanent like a tattoo, because the pigments are not implanted so deeply into the skin. Skincare also affects the duration of the pigments. To maintain the brows, touch up should be done every twelve to eighteen months. Treatment can be a little uncomfortable for those who are more sensitive. The level of discomfort is relatively minor. Some liken it to tweezing two to three hairs at the same time. Usually a topical anesthetic is used to numb the area being worked on. Topical anesthetics are safe and may contain lidocaine, tetracaine and epinephrine. The pigment is applied with a specific Phibrows tool that has a row of several fine needles to create thin hair like marks in the skin. Your artist will choose the pigment color according to your natural hair color, and skin type. The pigment is bladed just below the epidermis and the most shallow part of the dermis, making extremely fine natural looking hair strokes. A very natural result is achieved, as the hairs are bladed into the skin according to the natural hair growth direction. A touch up is included 4-6 weeks after your initial treatment. Usually Microblading is done in two sessions. The first takes approx. three hours. In the first session, the brow is shaped and styled to the client’s preference, and pigment is applied. Four to six weeks later, the client returns for the second session for touch up, This takes approx. two hours. Are there any pre-existing conditions that interfere when considering Microblading? Is there anything I need to do to prepare for my treatment? Shower and fix your hair as you need to. Take extra care not to get your brows wet for several days. The artist then draws on the eyebrow shape according to the PhiBrows golden ratio measuring tool. Brows are measured perfectly to complement your unique face shape and size. Next, the artist chooses the perfect PhiBrows color. Every treatment is performed with disposable sterile tools. After the treatment, the client is provided Skin Candy ointment to use twice a day, for 7 days. You may experience the following symptoms for the first few days which are common during healing process! Gently clean brows using Phi Wipes. Apply a light layer of Skin Candy, morning and night, to brows for five to seven days. If your enhancement gets wet, gently pat the area dry using a clean tissue and blow dry if possible. Avoid alcohol, aspirin, ibuprofen, and vitamins that may cause your blood to thin, for twenty-four hours. No swimming, increased sweating, practicing sports, tanning or saunas for two weeks. Any creams containing Retin-A or Glycol Acid on the face or neck for two weeks. Keep your hair away from your enhancement (especially your fringe for at least first 2 days) to prevent the possibility of infection. Do not drink alcohol in excess as it may lead to slow healing of wounds. Itching is normal. Please DO NOT PICK, PEEL OR RUB your enhancement, as the colour may heal unevenly, and you could risk infection, which in turn could lead to scarring. Allow the colour to flake naturally. Bear in mind that in many cases, some unevenness of colour is to be expected. This is the purpose of the re-touch visit allowing us to fine tune your enhancement. This is included in the initial cost, however if you do not attend your scheduled re-touch appointment you will be charged for any further treatment. Touch up is necessary because everyone heals differently, and therefore the outcomes may vary. Sometimes it is necessary to adjust the color and brow thickness by adding more strokes. In the touch up session, the final adjustments are made to assure the client’s satisfaction. The touch up is recommended 4-6 weeks after initial treatment. During your touch up, the artist will fill in missing hairs, add or make hairs longer, or just achieve a darker color. How's the Microblading healing process like? Your new eyebrows will go through several phases during the healing cycle. True reflection of healed color can only be assessed 3-4 weeks after treatment. Touch-ups and/or correction of the shape/design is recommended at least 4-6 weeks after initial treatment. Day after day the brows will look softer and start flaking, and the colour of the pigment will look 40-50% less intense, so your eyebrows will look more natural. Immediately after the procedure, the pigment will appear very sharp and dark. This is because the pigment is still seating on top of your skin and has not yet settled in completely. The color of the pigment will soften gradually (do not be alarmed if you see some pigment on the cotton swab, as this is excess pigment and/or body fluid that is naturally exiting your skin). Once the healing of the skin starts taking place it will look like dandruff flakes or dry skin. This might give you the impression that the color pigment is fading too quickly. However, this is just superficial color, and dry skin being naturally removed from your eyebrows. Your eyebrows will be the lightest tones during days 5-12 because the color is being absorbed in the deeper layers of the skin. Later skin cells push it back to the upper layers. Once the healing is completed, you will enjoy a pair of beautiful, new, natural looking eyebrows. Proper procedures and precautions are used to ensure safety. Either sterilized tools, or disposable tools are used in a sanitized environment. When pre and post care instructions are followed, the risk of complications are minimal. Allergic reactions to pigments are very rare, but sometimes occur. For this reason, a pigment patch test for those with sensitive skin, or to topical makeup products, gold, silver, nickel, or hair dyes, should be patch-tested a few days in advance of the procedure. Carefully choose your practitioner. Compare the work of various artists before choosing. Discuss your expectations and desired outcome, including the shape, style, and color you wish, with the artist. Realise that faces are never perfectly symmetrical. Adjustments may be made during touch up, such as pigment discoloration, and color correction. Remember that Microbladed brows will eventually fade away if touch ups are not done. I am so proud to be part of a new project that comes deeply from my heart. For those of you who have experienced trauma, you know that you can’t force the healing process, and you must be patient with the pace of recovery. When you’ve undergone a serious illness such as cancer, skin disease, or have been a burn victim, or been in an accident, it can be a long process to get back to the “you” that you were before these heartbreaking experiences. I'm offering anyone who has been through a life-altering trauma, the opportunity to get new brows and to simply “Pay with a Smile“. Whilst inner beauty generally shines through on the outside, having your outer beauty reflect the way you feel on the inside is a key element of confidence that should be the right of every person. Beauty is self expression!